30 Years On: The Jam’s Sound Affects Revisited! – Paul Weller News! 30 Years On: The Jam’s Sound Affects Revisited! 1 Comment on 30 Years On: The Jam’s Sound Affects Revisited! The Jam released Sound Affects three decades ago. Val Siebert assesses how it has weathered the intervening years. Paul Weller was barely 22 when he started recording Sound Affects, his fifth album in just over 3 years. He was reading histories of Camelot alongside the romanticism of Percy Bysshe Shelley and William Blake, obsessing over The Beatles’ Revolver, and delving further into his disillusionment with the political and social climate that had prevailed in England at the end of the 1970s. During the same time, Weller apparently had a ‘thing’ for electricity pylons. So, in short, the writer’s perceived influences on The Jam’s 1980 album included Arthur and Guinevere, the Mask of Anarchy, the Fabs, and wire transmission towers. Although all that sounds like a crock, Sound Affects is well and truly saturated with this murky mixture, as well as with the additional absorption of contemporary styles, 60s formulae and steadfast motifs that would mark the majority of Weller’s career. 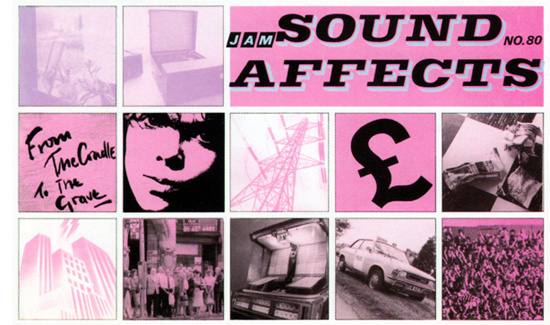 Sound Affects is Paul Weller’s favourite Jam album. This could be because it sounds “fresh” as he says, or it could be because it’s a self-contained piece of Weller himself – at least the bits he would respect and revisit. You have trademark deft social commentary (‘Man In The Corner Shop’, ‘That’s Entertainment’), battles with doubt (Monday’), laments of communication breakdown (‘Start!’) and spitting political rage (‘Set The House Ablaze’, ‘Scrape Away’). He works in his literary flair with a Shelley quote in the liner notes, the cover is a pop art collection of pictures that can each be related to an album track (not far from the artwork on 1995’s Stanley Road), and there is a smattering of 60s Beatles/Kinks/Small Faces influence about the whole thing. As for this silly business about electricity pylons: you actually can hear a stark, steely quality among the tracks that is very akin to that imagery – and is, as such, topically appropriate. However, the same could probably be said of a number of new wave/post-punk groups that were around at the time and that Weller was very into, such as Joy Division and Gang Of Four. The production of the album on a whole takes hints from these contemporaries (in great contrast to the dense and textured previous record Setting Sons) and Rick Buckler’s drumming in particular is very of-the-time. Weller has described the album, which was released 30-years-ago this month, as sounding like “a mixture between Revolver and Michael Jackson’s Off The Wall”, but as it so happens, little of this soul/funk influence seeps through clearly. As a matter of fact – and speaking strictly musically and not negatively – it’s arguably the least soulful Paul Weller record there is. Setting Sons would likely be up for the title if it weren’t for the casual inclusion of Vandella’s cover ‘Heatwave’ tacked on the end. But soul music, as a universal language, is probably the least offensive and least criticized form of pop. It does wade into political waters, but it’s never apocalyptic, aggressively confrontational and angry as tunes on this record are. Revolver, however, is a clear influence (at times too clear), but if I were to pick what it draws from the ether in place of Off The Wall, I would point to something more like Gang Of Four’s Entertainment along with Something Else by the Kinks and the Small Faces circa ‘67. Even so, a more practical way of looking at the album would be rather to see it as a collection of post-punk takes on 60s beat group tunes; or, perhaps as a tug of war between where The Jam had been and where Weller wanted to push them. Either way Sound Affects is a record of fascinating and convoluted roots. Weller often toes the thin line between homage and theft, but manages to come out the other side of it virtually unscathed. On that note, it’s probably best to start an appreciation of the album with the tune that both encapsulates Weller and that also most shamelessly shows off its roots. ‘Start!’ was almost not the first single off Sound Affects as Polydor were pushing for the safe, familiar and early-Jam-like ‘Pretty Green’, heated discussions ensued and the decision was left until the last moment – with sleeves for both possible singles sat waiting at the printers – but Weller subsequently prevailed. And, just as he’d suspected, the tune opened The Jam to new audiences and flew straight to the top of the charts. However, there can be no mention of The Jam’s second number one single without outlining the musical debt it owes to The Beatles’ George Harrison penned ‘Taxman’ (off Revolver, obviously). With identical opening bass line and punctuating guitar, the nick is undeniable. However, there was no action taken by George Harrison – an unsurprising fact when taking into account that, mere months after Sound Affects’ release, Harrison would be facing a final suit to determine damages in his subconscious theft of The Chiffons’ ‘He’s So Fine’. As for the inherent Weller-ness of the track, just check the 52-year-old’s latest, Wake Up The Nation, as it rails against the isolation of the computer age and the twisting of social context. Anyone that might criticize Weller for being a Luddite these days or may chock up his arguments for social contact over emails and texting to being an old technophobe need only look at ‘Start!’ to see that he was preaching the same concerns decades ago, before these advances in technology were even made. Musically, ‘Start!’ also pushed The Jam in new directions (especially in hindsight looking at the horn-soaked follow-up, ‘The Gift’), unlike ‘Pretty Green’ which wouldn’t be out of place on the group’s second record This Is The Modern World. Two other tracks off Sound Affects also retain a more early Jam sound. One of these is – and if any track takes a modicum of soul influence, it’s – ‘But I’m Different Now’. A mash of souly-punk thrashing and a pinch of Revolver’s ‘Doctor Robert’, its style of power pop is a development of the feel of In The City’s ‘I Got By In Time’ and ‘Non-Stop Dancing’ as well as All Mod Cons’ ‘It’s Too Bad’. The third old school Jam track is the sprightly and sanguine ‘Boy About Town’, that sees Weller busying about Oxford Street and which is not unlike the ‘mod anthems’ of his earlier records. The title may have come from a London-based commuter mag at the time called Girl About Town, but could just have easily been swiped from the lyric of The Kinks’ ‘Well Respected Man’. And Lo! We have the 60s nick number two after Revolver. And there is, indeed, a third. There cannot be much more said about the album’s masterful centerpiece ‘That’s Entertainment’ that hasn’t been already. It’s a piece of urban art in league with Banksy – about finding beauty in the little noticed and sometimes maligned details of the grey mood and mundane routines of city life. The unsubtle words are accompanied by simple acoustic instrumentation, all appropriately stripped down for a tune that needs no bells and whistles. However, even this monster tune is not without influences worn brazenly. The lyrics take inspiration from a poem by the young poet Paul Drew called ‘Entertainment’ and Weller favourites The Small Faces’ ‘Itchycoo Park’ lends the spinal chords to the intro. If you were to need any more proof of The Beatles, Small Faces and The Kinks incorporations (and while we’re at it, let’s throw in the backwards guitar at the start of ‘Dream Time’ a la ‘I’m Only Sleeping’), I would mention the fact that it also follows the 60s formula of ‘raucous song first, downbeat song second’ with ‘Pretty Green’ coming before ‘Monday’. This idea is well used among the 60s albums like Something Else (‘David Watts’ then ‘Death Of A Clown’), Revolver (‘Taxman’ then ‘Eleanor Rigby’), Help! (the title track then ‘The Night Before’), even Pet Sounds (‘Wouldn’t It Be Nice’ then ‘You Still Believe In Me’) – the list can continue. Still unconvinced? Unlikely, but I’m not done. Then, all you need to do is pick up the new deluxe edition reissue of Sound Affects out this month, which includes 22 bonus tracks, and among them, many covers. Covers of whom, you ask? You guessed it! The Kinks (‘Waterloo Sunset’, ‘Dead End Street’), The Beatles (‘Rain’, ‘And Your Bird Can Sing’) and The Small Faces (‘Get Yourself Together’). However, I would probably recommend only ‘Dead End Street’ as Weller doing covers has never sat well with me; mostly because they never seem to sit well with him. I think it comes down to Weller being a terrible liar. His covers usually sound unenergetic and uninspired (probably why covers LP Studio 150 is the only consistently awful record in the man’s otherwise upstanding catalogue). Besides these firm 60s roots, Sound Affects stands up superbly over many of its now-dated contemporaries. In fact, the opening stabs of guitar in ‘Music For The Last Couple’ (the only song here credited to all band members) is just waiting to be snapped up by one of these post-post-punk, new-new-wave groups like Chapel Club and the melody of Weller’s ode to human nature ‘Man In The Corner Shop’ was even used by The Strokes in ‘You Only Live Once’. And of course, we can’t forget the familiar ‘angry young man’ tunes that The Jam’s frontman was so well known for. The dystopian ‘Set the House Ablaze’ serves up an aggressive portrayal of a society being misled. Weller, not often one to understate in political reference, cites the Reichstag fire that cemented the Nazi Party’s hold over Germany as a comparison to the current political climate in England. ‘Scrape Away’ follows ‘Set The House Ablaze’ in motif – both songs would have been fitting on Setting Sons – and is a perfect example of the sharp, cold and steely imagery I mentioned earlier. A forceful bass line from Bruce Foxton is sawed by serrated guitar and Weller’s voice is decidedly discordant – very fitting in that I doubt there are many tuneful ways to effectively express lyrics such as: “Your twisted cynicism makes me feel sick/Your open disgust for ‘Idealistic naive’”. The toxic influence of politicians is a very common thread in Weller’s song-writing fabric, even though he forgot his own advice in joining in Labour tour Red Wedge during The Style Council days, he would revisit many of these convictions in solo years with songs like ‘Savages’. Now, back to this fantastic 30th anniversary reissue. There are quite a few things that make this worth picking up aside from the covers. The previously unreleased tracks include demos and alternate versions of the album tracks as well as two instrumentals, but the collection itself is more impressive than its collectability. There are two versions of the sublime b-side ‘Liza Radley’ as well as ‘Pop Art Poem’, a purely Weller number, all instruments played by the man, then sped-up, slowed down and thrown into a psychy jumble of whirs and bleeps and heavy breathing underneath a deadpan spoken word affair. A demo version of ‘That’s Entertainment’ brings a crisper vocal and a cheeky amendment to the lyrics (“cuddling a warm guy”) and the inclusion of the delicate ‘No One In This World’ shows that Weller’s balladeering could already have competed with the best of The Style Council’s like ‘Ghosts Of Dachau’. It’s tracks like this that provide fleeting glimpses of what is to come, without relinquishing The Jam’s idiosyncrasies. Pete Townshend once perceptively said of Weller: “I’ve never met an artist so terrified of appearing hypocritical.” This behaviour is likely the result of the fallout from a statement by a very young Paul, fleetingly mentioning Tory sympathies – this would come back to bite, or rather gnaw, him for the rest of his career. Although I hate to give credence to a slightly more than bitter account on Weller, ex-pal Paolo Hewitt’s Changing Man claims that the Modfather is much more articulate of his feelings in song form than any other way, for better or worse. If this claim is legitimate, paired with Weller’s distaste of going back on his word, the fact that Sound Affects is his favourite of the period makes it his most personally defining of the period. It’s when everything that Weller wanted for himself came together and he apparently still sees it that way. And with the extraordinarily varied career that has followed 30-years on, that’s really saying something. One of my favourite album covers! Previous Entry More Paul Weller In New York City! Next Entry Fan Pics Of Paul Weller At The Wiltern In LA!